Icebox was asked to design and create two 100 square metre complete ice bars, fitted into decorated freezer facilities, in sensitive city centre locations in London and Manchester. The interior design and ice detailing had to incorporate specific features from the Coors Light TV advertising campaign and links to social media competition campaigns. 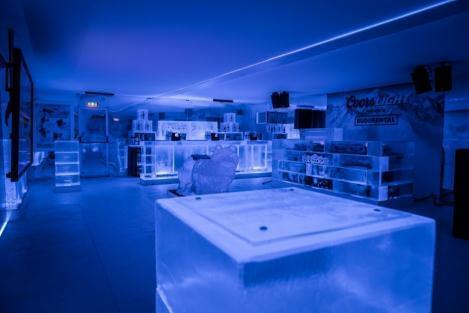 Icebox created a layout that would still accommodate seventy five persons at one session, with the bar and back bar, DJ station in ice and the various decorative features, internal lighting and Coors Light branding. Using 10 tonnes of crystal clear carving ice, honed and carved, Icebox came up with the most effective and dramatic solution. With limited access and a build time of just 24 hours for each site, the installation and removal at the end of the night had to be carried out meticulously, safely and professionally. Icebox delivered on every level, delighting the client, making this happen at an exceptional level. The end client, Molson Coors and Life Agency agreed this was an exceptional campaign, exceeding social media, experiential and all targets.